12:21 Then Moses called all the elders of Israel and said to them, “Go, select lambs for your families, and slaughter the passover lamb. 22 Take a bunch of hyssop, dip it in the blood that is in the basin, and touch the lintel and the two doorposts with the blood in the basin. None of you shall go outside the door of your house until morning. 23 For the Lord will pass through to strike down the Egyptians; when he sees the blood on the lintel and on the two doorposts, the Lord will pass over that door and will not allow the destroyer to enter your houses to strike you down. 24 You shall observe this rite as a perpetual ordinance for you and your children. 25 When you come to the land that the Lord will give you, as he has promised, you shall keep this observance. 26 And when your children ask you, ‘What do you mean by this observance?’ 27 you shall say, ‘It is the passover sacrifice to the Lord, for he passed over the houses of the Israelites in Egypt, when he struck down the Egyptians but spared our houses.’” And the people bowed down and worshiped. 55 Now the Passover of the Jews was near, and many went up from the country to Jerusalem before the Passover to purify themselves. 56 They were looking for Jesus and were asking one another as they stood in the temple, “What do you think? 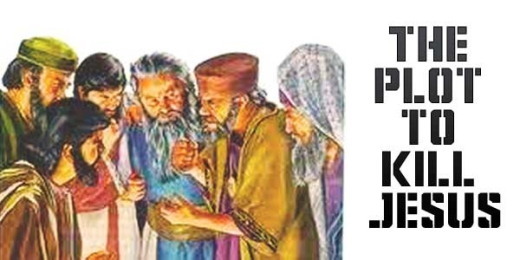 Surely he will not come to the festival, will he?” 57 Now the chief priests and the Pharisees had given orders that anyone who knew where Jesus was should let them know, so that they might arrest him. Caiaphas, being high priest that year, prophesied that Jesus was about to die for the nation, and not for the nation only, but to gather into one the dispersed children of God.